A great day out for the whole family to enjoy. Not just another day trip, the aquarium location is packed full of facilities and nearby attractions. The Malta National Aquarium in Qawra, which has been in the offing for years, is now a must visit attraction for locals and visitors. The project is spread over approximately 20,000 square meters and comprises a public aquarium, a public landscaped belvedere at promenade level, a multi storey car park, facilities for local dive schools, catering facilities including a popular beach club (Café del Mare), a merchandise outlet and a tourist information kiosk. The public aquarium includes 26 display tanks with, amongst others, Mediterranean fish, including fish commonly found in Maltese waters together with replicas of historical artefacts that one can find in the seas around the Maltese islands. The main tank of the aquarium houses species from the Indian Ocean, including eight black tip sharks, horn sharks, rays, eels and other exotic species. 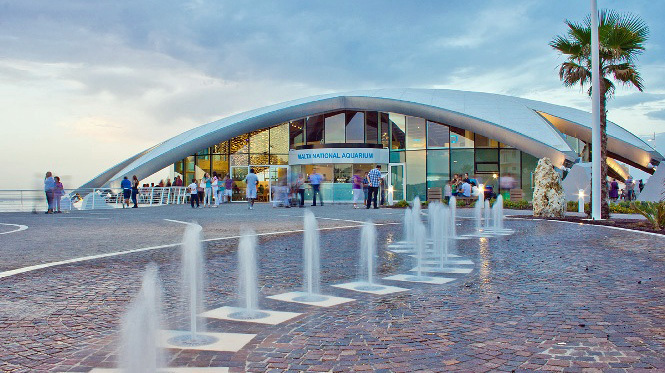 The main tank is approximately 12 meters in diameter and has a walk-through tunnel that allows visitors to experience the fish at a much closer range. All tanks are expertly themed to replicate the underwater environment. The National Aquarium is in an iconic curved shell structure in the form of a starfish. The adjacent promenade provides additional recreation facilities including a children’s play area.The Aquarium is situated in the northeast of the island, in Qawra, which forms part of St. Pauls Bay. €6.00 for children (5 to 12). A precious addition to Malta’s entertainment scene, Café del Mar Malta opened its doors in July 2013 for its first summer of music, sunset and fun. Offering stunning views of the Mediterranean Sea and St Paul’s island, Café del Mar is fast establishing itself as the place to be. Forming part of the Malta National Aquarium complex, Café del Mar is the ideal place to relax, have a swim and enjoy a drink from a variety of cocktails. You can also have a meal with an unmistakable and delightful Mediterranean flavour. 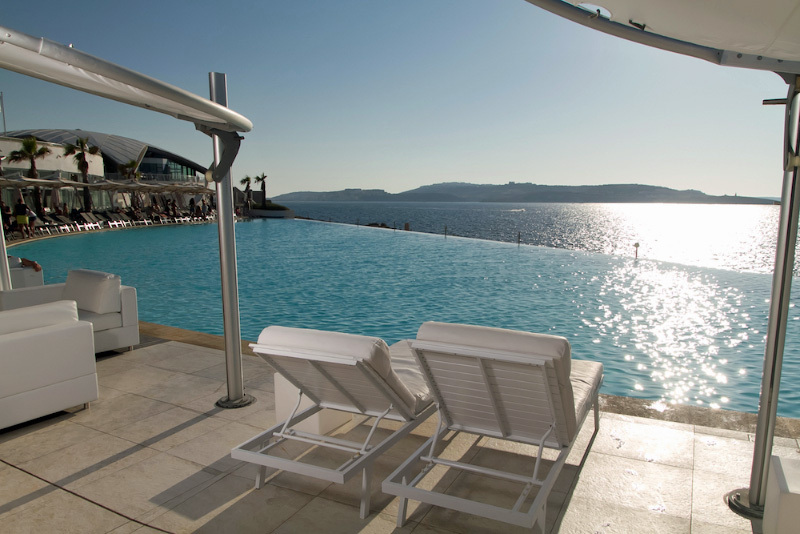 Designed by one of Malta’s foremost designers, Mark Pace, Café del Mar sits magnificently at the water’s edge. The design is all about the sea and Mediterranean sunsets. The infinity pool reaches out into the clear blue waters. The seating area and pool deck have unobstructed panoramic views of the sea. The design is simple, predominantly white to fully compliment the natural beauty of the surroundings. The central idea of the design is simple, it allures you to sit and admire the views against a backdrop of ambient and chill out music, synonymous with Café del Mar. Café del Mar is hugely famous around the world for its chill-out compilation albums which have been released annually since 1994, pioneering the chill-out genre. Special guest DJs will entertain guests whilst enjoying the surroundings. So come join us and enjoy the simple things in life… amazing views of the blue Mediterranean Sea, stunning sunsets, refreshing cocktails, chill-out music and great Mediterranean food. Tickets for the Café Del Mare can be bought at the door.